CIDCO housing lottery 2018 draw results are announced at its official website cidco.maharashtra.gov.in or lottery.cidcoindia.com on 2 October 2018. 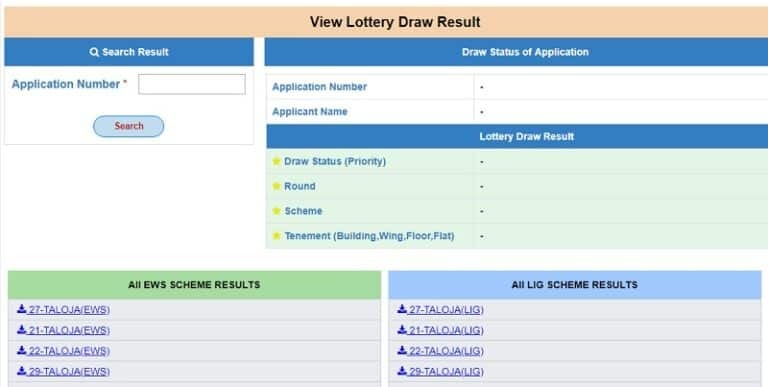 The draw for CIDCO lottery has begun at 11 a.m and the complete winners list has been published at 6 p.m. All those candidates who have filled the online application forms with a dream to buy flats at affordable prices can check the CIDCO lottery results 2018 and check the list of winners online for Navi Mumbai region. CIDCO lottery is offering 14,838 apartments in Navi Mumbai region under Pradhan Mantri Awas Yojana for economically weaker sections (EWS) and lower income group (LIG). The buildings are going to be constructed at 11 locations across Kharghar, Kalamboli, Taloja, Dronagiri and Ghansoli. These includes 5,262 flats for EWS category with carpet area of 25.81 sq.mt and the remaining will be built for LIG category people with carpet area of 29.82 sq mt. 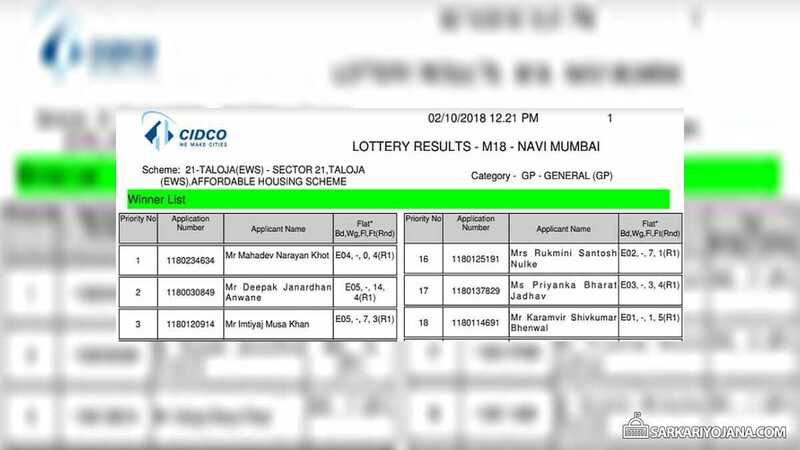 The winners list for CIDCO housing scheme 2018 (Navi Mumbai) is now available at the official website cidco.maharashtra.gov.in and the draw result for lottery has been declared. Here candidates needs to enter their details like applicant name and application number to view their draw results for CIDCO lottery. Even all the EWS scheme results and LIG scheme results are available for downloading purposes. Candidates can check their name manually in the downloaded list of selected applicants. CIDCO lottery complete results and winners list can also be checked online at lottery.cidcoindia.com or cidco.maharashtra.gov.in. All the winners who got selected will get SMS on their registered mobile number. The helpline number for CIDCO lottery 2018 is 1800222756 and is available between 8 a.m to 8 p.m.
Heartiest congratulations to all those selected applicants who got selected in the draw for the lottery. Now all such candidates can realize their dream of possessing their own affordable houses in Navi Mumbai region. All those applicants whose name appears in the selected applicants list but does not want to claim their houses due to any reason can apply for refund before 10 October 2018. In such cases, applicants in the waiting list will get those houses. My name is in winners list, pls. guide for further process. CONGRATULATIONS TO ALL THE JOURNALISTS WHO HAD WON HOUSES IN CIDCO LOTTERY 2018. Some one can please tell me If my name is there in selected application but not in the waiting list so is there any chance to get the house in any R4 waiting list as I see I am not in the R3 waiting list and the R4 waiting list is empty for kharghar sec 40 node, kindly help. Some one can please tell us If my name is there in selected application but not in the waiting list so is there any chance to get the house in any R4 waiting list as I see I am not in the R3 waiting list and the R4 waiting list is empty for kharghar sec 40 node, kindly help.